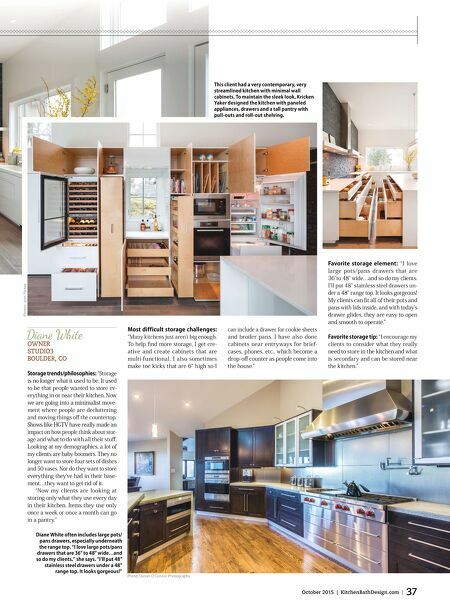 October 2015 | KitchenBathDesign.com | 37 OWNER STUDIO3 BOULDER, CO Storage trends/philosophies: "Storage is no longer what it used to be. It used to be that people wanted to store ev - erything in or near their kitchen. Now we are going into a minimalist move- ment where people are decluttering and moving things of the countertop. Shows like HGTV have really made an impact on how people think about stor- age and what to do with all their stuf. Looking at my demographics, a lot of my clients are baby boomers. They no longer want to store four sets of dishes and 50 vases. Nor do they want to store everything they've had in their base- ment…they want to get rid of it. "Now my clients are looking at storing only what they use every day in their kitchen. Items they use only once a week or once a month can go in a pantry." 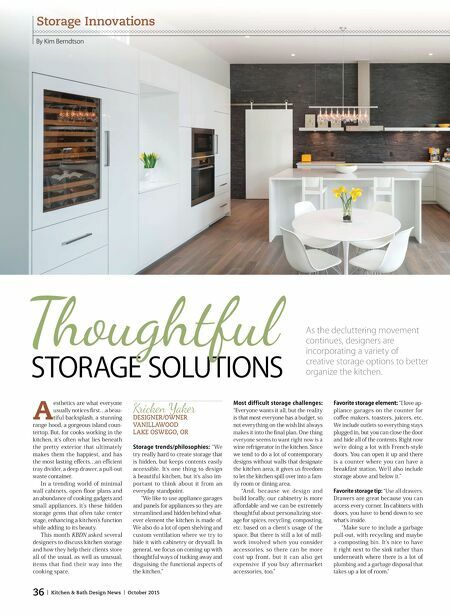 Most difficult storage challenges: "Many kitchens just aren't big enough. To help fnd more storage, I get cre- ative and create cabinets that are multi-functional. I also sometimes make toe kicks that are 6" high so I can include a drawer for cookie sheets and broiler pans. I have also done cabinets near entryways for brief- cases, phones, etc., which become a drop-of counter as people come into the house." Favorite storage element: "I love large pots/pans drawers that are 36"to 48" wide…and so do my clients. I'll put 48" stainless steel drawers un- der a 48" range top. It looks gorgeous! My clients can ft all of their pots and pans with lids inside, and with today's drawer glides, they are easy to open and smooth to operate." Favorite storage tip: "I encourage my clients to consider what they really need to store in the kitchen and what is secondary and can be stored near the kitchen." This client had a very contemporary, very streamlined kitchen with minimal wall cabinets. To maintain the sleek look, Kricken Yaker designed the kitchen with paneled appliances, drawers and a tall pantry with pull-outs and roll-out shelving. Photos: Josh Partee Photo: Daniel O'Connor Photography Diane White often includes large pots/ pans drawers, especially underneath the range top. "I love large pots/pans drawers that are 36" to 48" wide…and so do my clients," she says. "I'll put 48" stainless steel drawers under a 48" range top. It looks gorgeous!"